Yesterday on my way to home, I heard on radio that some Costco stores in the California’s Bay area are setting limits on how much rice and flour a customer can purchase. According to Costco’s CEO, the limits were put in place after what he saw as “unusual demands” for basic items. And Costco is not alone. Today, a story in USA Today says that Costco’s rival, Sam’s Club, is also limiting the amount of rice its customers can buy. So what’s the reason behind the action from warehouse clubs like Costco and Sam’s Club, which serve both individual shoppers and small business owners? Apparently, it has something to do with the recent surge of rice price, as well as the prices of corn and wheat. 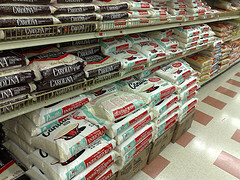 Increased media coverage on food shortage in some countries (UN’s World Food Program yesterday called the food crisis a “silent tsunami of hunger“) also fueled concerns among consumers in this country about supplies of food staples, though there’s no shortage here in the U.S.
Tonight, when I told my wife the stories I heard about Costco and Sam’s Club, she said maybe we should get a couple of bags of rice this weekend, just in case. Since a 20-lb bag of rice, which typically costs between $8 and $15, can last nearly two months in our house, I am far from in the panic mode. However, with food prices on the rise, groceries are taking a bigger and bigger share in our monthly expenses, just like gasoline. I think all of this is borderline ridiculous. Yes, there are increases in food prices, but the media is extrapolating the effects of third world countries onto us. Yes, higher prices for the poor is a bad thing, but for the typical American who can get by for many months on 20 or so pounds of rice, this is unnecessary fearmongering. What does a 20 pound bag of rice cost now in discount stores? 12-20 dollars? 20 dollars to feed a few people (if necessary) for a month or two is incredibly cheap. Again, we’re not talking about those living on the streets without any money or even a roof over their heads. We’re talking about people shopping at Costco and Wal-Mart. So they are not only buying rice, but probably buying 2-5 dollar a pound beef or pork, and maybe 6 dollar a pound boneless chicken, and everything else that makes up a meal. So this hoarding of staples is going on, perpetrated by the media, is a bunch of crap. Of course if major media outlets that reach hundreds of millions of people says that other people are hoarding food items, you’ll spark fear into many others who think they need to do the same. All this is going to do is create a major problem out of a relatively small problem that could be addressed without such measures. I think it was in P.J. O’Rourke’s book “All The Troubles In The World” where he talks about famine. While food shortages happen naturally, famine is a result of politics. There was a case in British India where a rumor went around about entire crops (probably rice) being wiped out. People started hoarding food. The British declared hoarding illegal. This only confirmed the rumor in the people’s eyes and the hoarding increased. The price of food skyrocketed because it disappeared from the open market and was sold on the black market. Thousands died of starvation. However, the rumor was false. There was no shortage of food. However, the people had a perception of a shortage and reacted by hoarding which only made the situation worse. I have not stock pile the rice. Although I bought the rice 4 days after it raised price, yuk! That being said, I think buying the agri stocks will be more profitable to take advantage of soft commodity boom. As you may know, I hold SYT for now. I kid you not, the family that lives in my parent’s in-law unit came home one day with about 5 50lb bags of rice. I asked them why they needed so much and they were telling me how the price keeps going up. Personally I don’t think its necessary at all, I agree with Jeremy. I would just keep buying like usual. Sure it can be $10-$15 more but one bag lasts so long. If we all go buy more bags then we need it makes matters worse. Honestly, it just sounds like more fearmongering. It’s true that speculation, rumor and fear play a large role in driving up prices recently, even though there isn’t any kind of shortage in this country at least. And stories like Costco and Sam’s Club are limiting the amount people can buy could potentially make matter worse and make people feel there’s indeed problem in the food supply china. STLPlace: Yeah, I read you own SYT. Actually, I was thinking of buy some agri ETF, but didn’t because of the record prices of agri commodities. If I buy now, it’s probably a little too late, especially for the current round of advance in price. yup, it’s media fueling the hype. what they forget to say is that the rice or wheat will probably go bad by the time you have a chance to use it if you hoard it for the common person.